OK, this is not a Los Angeles story, yet. Memphis, TN’s WREG Channel 3 News investigative journalist Scott Noll has broken this chilling story on his “On Your Side Investigators” news segment. WREG’s On Your Side Investigators took RFID Security Expert Walt Augustinowicz of Identity Stronghold for a leisurely stroll down Beale Street in Memphis. Armed with an inconspicuous card reader and notebook PC, Augustinowicz was easily able to read the credit card numbers and expiration dates of credit cards in passerby’s wallets and purses. It’s frighteningly easy to be electronically pickpocketed, and it looks like this new RFID technology has some major security flaws. Just imagine a crowed LA Mall amid the pre-Christmas shopping crush, and an inconspicuous man or woman with a concealed card reader, and we’ll have an identity theft and credit card fraud nightmare on our hands. Thanks to WREG’s On Your Side Investigator Scott Noll for breaking this important story. The Beverly Hills murder mystery surrounding the death of 64 year old Hollywood publicist Ronni Chasen, took an unexpected turn this week when Harold Smith, a 37 year old convicted felon blew whatever brains he had out just as Beverly Hills Police were about to question him. 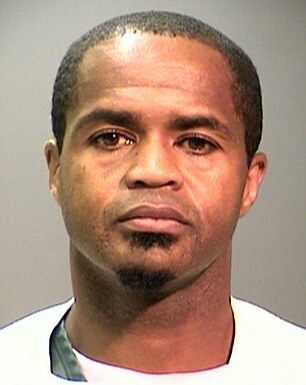 Smith was described by Beverly Hills Police as a “person of interest” after they followed up on a tip received by America’s Most Wanted that Smith had bragged about his involvement in the slaying of Chasen. The UK Daily Mail has some excellent reportage on the current status of the ongoing investigation into Chasen’s death, as well as some insight into the pathetic existence of Harold Smith, who probably had no connection whatsoever to the death of Chasen. 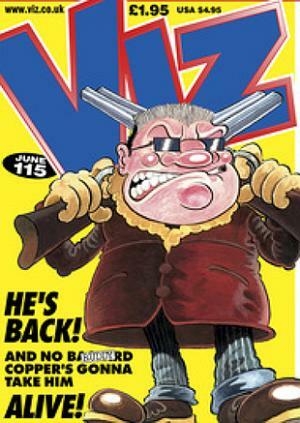 Viz magazine regularly features "Big Vern" a smalltime crook who "Tops himself" whenever questioned by the police. Readers familiar with the satirical British publication “Viz” will immediately recognize Smith’s actions as analogous to those of “Big Vern,” a cartoon character who routinely “Tops hisself” rather than be taken alive by the police. Detectives at Beverly Hills Police Department could not confirm whether Smith had ever read Viz magazine or was familiar with Big Vern. However, sources close to the investigation believe Smith may have viewed Viz online and have identified with Big Vern. Smith’s last stand at the seedy Harold Apartments in Hollywood did everyone a huge favor. There is now one less piece of human garbage to clog up the criminal justice system. Brown Calls For Action – Nobody Shows Up! If the turnout for Jerry Brown’s ‘Rally For Action’ at the Central Library in Downtown Los Angeles today, is any indication of the true level of support for Jerry Brown, Barbara Boxer and a host of Democrat hopefuls, then Jerry’s headed into retirement, and we can all call Barbara Boxer ‘M’am’ without incurring her wrath. Berger opined that “there may have been around 20 or 30 supporters, but I think a few of them were Japanese tourists.” Berger commented that the tourists took photos but were not sure of the nature of the event. “I told them it was a celebration for a new Starbucks opening up, and they nodded enthusiastically.” Berger said. At around 2pm the LA Slimes checked the Los Angeles Times “L.A. 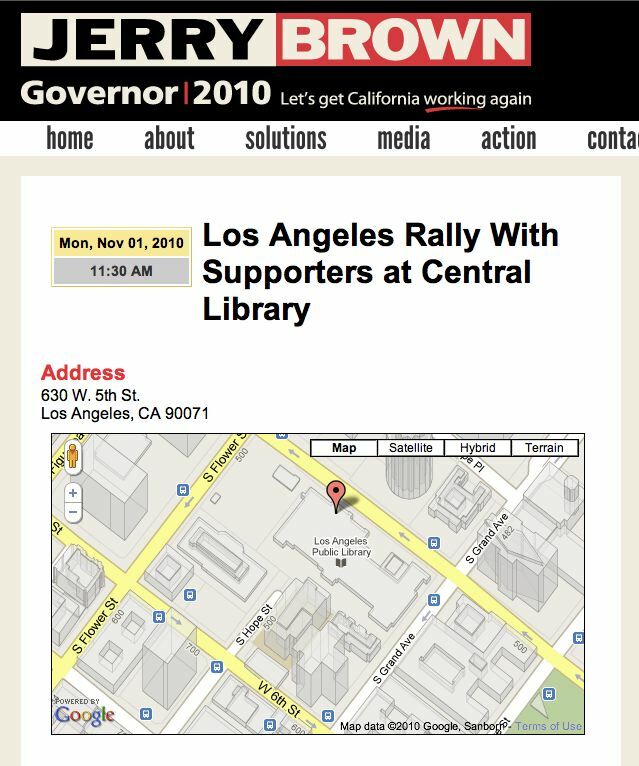 NOW” news blog, and found a report indicating that there was a “Boisterous Rally” for Jerry Brown and other Democrat candidates, and that there was “a crowd of roughly 200” outside the Central Library. Curiously, when we went back to the LA Times, the story had vanished from their “Breaking News L.A. NOW news blog, perhaps because of the obviously embarrassingly low turnout. After much searching we later found the story buried in the PolitiCal Section. If there is a grain of truth in the LA Times’ use of the word “boisterous” it might relate to Los Angeles Mayor Antonio Villaraigosa. Never one to miss a good photo op, according to Berger, he “made a complete fool of himself” screaming ‘Jerry! Jerry! Jerry!’ while everyone else “appeared quite nonplussed and mumbled support. It was painful.” Berger said. We are not ones for conspiracy theories, but it really does look like the LA Times choose to bury a story that does not fit the manipulated polls showing Brown and Boxer so far ahead of Republican challengers Whitman and Fiorina. Winning Los Angeles is crucial for any candidate, and if the turnout today is indicative of the true level of support for Brown, Boxer and the rest, then tomorrow’s election could mean a very bleak future for Democrats, and perhaps some awkward questions about how much we can trust those who deliver opinion polls. 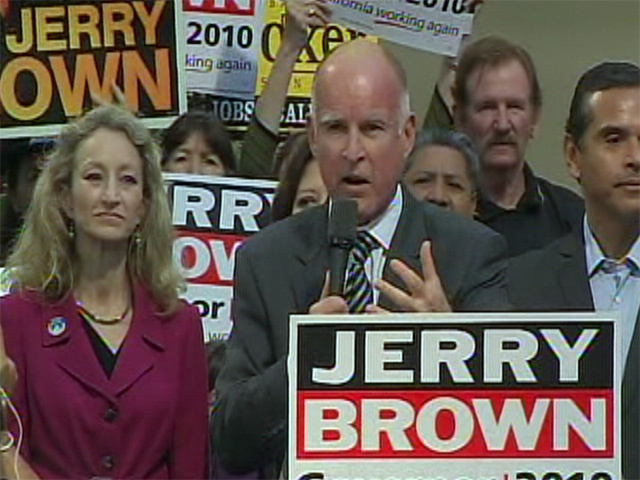 Brown's Rally was well publiciized on his campaign website, yet few turned up. Voting starts at 8:00am tomorrow, Tuesday, November 2, 2010. First results are expected at around 8:05pm when the count of mail-in ballots are typically released. Los Angeles District Attorney Steve Cooley, the centrist Republican candidate for Attorney General, is widely expected to do well in the mail-in ballots, as his opponent, San Francisco District Attorney Kamala Harris could not afford to start her attack-ad campaign in earnest until last week. Harris, who boasts of herself as the “Female Obama” has apparently closed the gap to Cooley in the last few days, but few take her seriously as an Attorney General given the numerous scandals that point to her ineptitude and lack of comprehension of complex legal issues, like the constitutional requirement to turn over evidence to the defense. 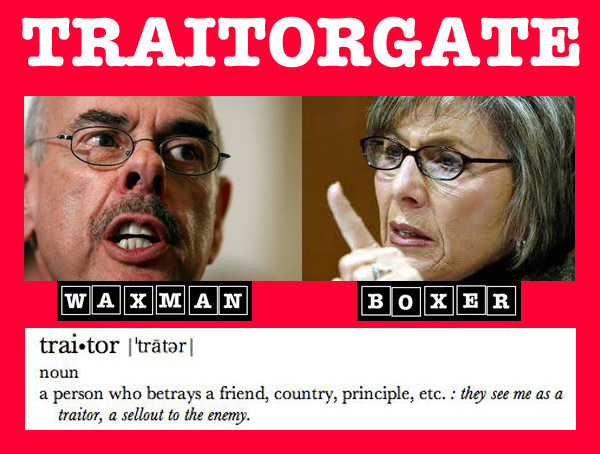 Shocking revelations in the Daily Caller today disclose that Senator Barbara Boxer and Congressman Henry Waxman both provided diplomatic facilities to enable “radical antiwar activists” to “cross the Iraqi-Jordanian border in order to deliver aid to families of enemy insurgents in the war-ridden Iraqi city of Fallujah” according to an op-ed article written by political advisor and commentator Chris Garcia. Garcia cited Robert “Buzz” Patterson’s new book, ‘Conduct Unbecoming‘ as the source of the dynamite allegations that Boxer and Waxman were central to ensuring that the anti-war activists would be able to complete their mission. In his book Patterson claims that the anti-war activists “delivered more than $600,000 in cash” to the insurgents in Fallujah in December 2004. There is no doubt whatsoever that the damning allegations in Patterson’s book, coupled with Garcia’s op-ed today, will have been noticed by Boxer and Waxman. Their government-issued Blackberries were probably abuzz today with anxious questions from democrats who must be shocked, disappointed and disgusted at the roles played by Boxer and Waxman in the betrayal of those brave US Servicemen who perished in the service of their country. that hailed Boxer and Waxman as instrumental in thwarting Pentagon efforts to deny aid and comfort to the enemy in 2005, and that was still viewable online yesterday, was somehow unavailable today? 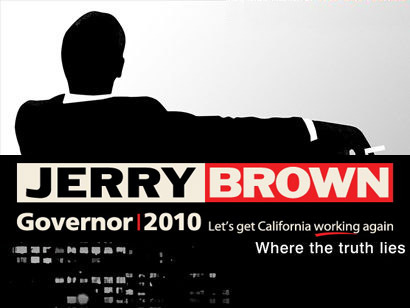 “She’s, she’s a whore!” “Well I’m going to use that!” Those are the words that continue to dog Jerry Brown’s campaign to be the next governor of California. They come from Brown’s fumbled attempt to leave a voice mail message seeking an endorsement from a union leader. Although it is clear that Brown said “Well I’m going to use that!” Steven Glazer, the Brown campaign spokeshole, attributes the “She’s, shes a whore!” comment to an un-named campaign worker. Many see the use of the term “whore” as not only slur not only on his opponent, Meg Whitman, but reflective of the way some older males like Brown still tend to regard women who achieve success in the workplace. Nicky Diaz Needs Your Help. Will you be as heartless as Meg Whitman and say "No?" The heart wrenching story of rags to riches housekeeper Nicky Diaz has captured the hearts of Americans. The Los Angeles Slimes is proud to offer its readers the chance to help Nicky Diaz in the difficult times ahead, as she waits for the big payoff she’s been promised. Please click here or on the ‘Help Nicky Diaz’ tab above to express your support, love and encouragement for Nicky and her family. The more money you send to her, the more she will know how much you care. If you are an illegal alien like Nicky and you have not opened a bank account here in America with forged documents, like Nicky has, you can also go to Western Union and send money to Nicky there. You can also express your support for Nicky by participating in our poll at the bottom of this page. El relato desgarrador de la pobreza a la riqueza ama de llaves Nicky Díaz ha capturado los corazones de los estadounidenses. El diario Los Angeles Slimes se enorgullece de ofrecer a sus lectores la oportunidad de ayudar a Nicky Díaz en los tiempos difíciles en el futuro, mientras espera la gran recompensa que ha prometido. Por favor haga clic aquí o en la pestaña “Ayuda Nicky Díaz arriba para expresar su apoyo, amor y aliento a Nicky y su familia. Cuanto más dinero que usted envíe a ella, más se sabrá cuánto te importa. Si usted es un extranjero ilegal como Nicky y no se ha abierto una cuenta bancaria aquí en Estados Unidos con documentos falsos, al igual que Nicky tiene, usted también puede ir a Western Union y enviar dinero a Nicky allí. También puede expresar su apoyo a Nicky al participar en nuestra encuesta en la parte inferior de esta página. While the LA Slimes exclusively revealed the rumor of a big pay day for Meg Whitman’s former housekeeper, Nicky Diaz, others in the media were equally dubious of the story of hardship at $23/hr that Nicky Diaz was spinning through her attorney, Gloria Allred. Well “thank you” America for a free press and a strong First Amendment that allows shady shenanigans to be revealed for what they really are. Thanks to some truly excellent research by talk show host Hugh Hewitt, even more doubt was cast as to the credibility of both attorney Gloria Allred, and her client. It seems that Gloria Allred has pulled pre-election stunts like the Nicky Diaz stunt before. Do take a moment to listen to Hugh Hewitt’s excellent interview of Allred, and note Allred’s evasiveness when Hewitt makes the point that the Rhonda Miller case was thrown out of court. So, is the Nicky Diaz case simply a baseless and contrived frivolous lawsuit orchestrated by Gloria Allred simply to help a fellow democrat and perhaps position herself for a role in Jerry Brown’s administration? If Nicky’s rumored Puerto Vallarta job and Univision reality tv show are true, this time Allred stands to make a tidy sum as well as helping Jerry Brown.